What are the costs of being a member of Alpha Sigma Alpha? 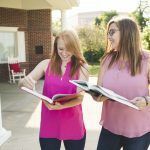 Every chapter sets up their own financial dues based on programming, leadership development activities, sisterhood retreats and other events or discretionary costs on top of national membership dues. Where can I purchase Alpha Sigma Alpha gifts for my daughter? In Alpha Sigma Alpha, there are many ways for parents to be active and involved. Chapters most popularly host Mom’s, Dad’s or Parent’s Weekend events at certain times of the year to promote bonding with your daughter, her sisters and other parents. There are also many volunteer roles offered for parents. Are you interested in being an advisor? Mothers, if you are not already a member of another NPC sorority, take a look at alumnae initiation to learn how to become a member yourself. But most importantly, your involvement in your daughter’s life as a member of Alpha Sigma Alpha just as with anything requires your love and support. We thank you for who your daughter is. We are proud to call her our sister. Will she be living in a house with the rest of her sisters? Maybe. Many chapters of Alpha Sigma Alpha have a designated sorority house, lodge, suite, etc. while many others do not. Either way, it is very common to find members of Alpha Sigma Alpha, their sisters and best friends, living together. Will she have time to be involved in anything outside of Alpha Sigma Alpha? Of course. As a member of Alpha Sigma Alpha your members will have the opportunity to be as involved in leadership positions as she aspires to be. Members are strongly encouraged to be active in at least one other student organization. One of Alpha Sigma Alpha’s eight core values is balance; therefore members seek and find the challenges of being active alongside being successful students. What is Alpha Sigma Alpha stance on hazing and alcohol? Alpha Sigma Alpha outlines its position on matters important to our members through the Alpha Sigma Alpha National Policies and Procedures. These policies and position statements cover our stance on hazing, FIPG, human dignity, sexual harassment, media and internet usage. Contact the Alpha Sigma Alpha National Headquarters to learn more about these policies.